While this dish is typically associated with the holidays, it really is delicious anytime of the year. This sweet potato casserole is full of healthy sweet potatoes and then topped with a sweet pecan crumble. Most would consider this a perfect side dish but the dessert like topping makes the casserole great for after dinner as well! The slight crunch of the crumble is a fantastic contract to the soft sweet potatoes and as this recipe is pretty easy to make, you really will want to make it year round. Peel the sweet potatoes and then chop into pieces about 1″ by 1″. This does not have to be exact but you want to have nice small sweet potato chunks so that they will cook quickly. Place the sweet potatoes in a large pot of water and boil for about 15 minutes or until the potatoes are soft. (a fork should easily go through the potatoes). Drain the water from the pot. Place the sweet potatoes in the bowl of a stand mixer and mash them with the paddle attachment. Add the sugar, egg, salt, and cinnamon and blend. Scrape down the sides of the bowl and add the heavy cream and vanilla. Mix until everything is fully combined. Set aside for now. 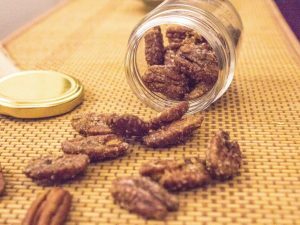 In a separate small bowl, mix the brown sugar, flour, butter and chopped pecans using your hand. rub the butter into the flour and sugar until it is crumbly. 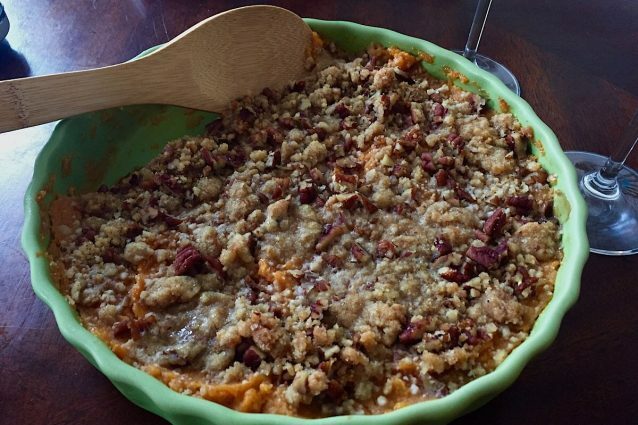 Spread the sweet potato mix in a casserole dish then sprinkle with the pecan crumble. -If you love sweet potato casserole with marshmallow topping, make the sweet potato base the same as this recipe. After you spread the sweet potatoes in the casserole dish, sprinkle with mini marshmallows and bake until the marshmallows are golden brown. -Try this casserole warm with a scoop of vanilla ice cream as a tasty dessert!